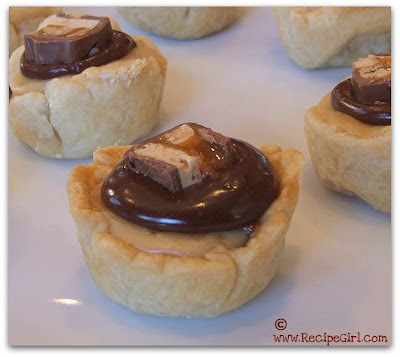 You simply can't go wrong with a dessert that incorporates your favorite candy bars... especially those that you consumed often (without worries of weight gain) when you were much younger but now rarely indulge (because of worries of weight gain). When's the last time you ate a regular-sized Snicker's Bar? Really. Perhaps I'm too weight-concious, but I don't believe I can recall eating any kind of candy bar since Halloween. Other desserts... yes... many. For some reason those don't seem as bad as a candy bar! I've mentioned my fondness for candy bar dessert recipes before. 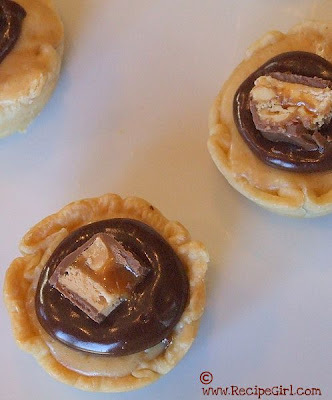 And here's another one for you to add to your "to-try" list: Snicker's Bar Tarts... the link is not working, but this should work (cut/paste the link below... clicking won't work)... pesky blogger!! See that oozing puddle of chocolate ganache on top??? That sits afloat a filling of peanut butter cheesecake (with a chunk of snickers sneakily hidden inside too!) Since the recipe is from Pillsbury, it's a quick and easy dessert. The refrigerated pie crusts are used as the base. I don't see any reason at all to use your best homemade crust since the flavor isn't focused on the crust in this recipe. But have-at-it if you wish to do it all from scratch. I do suggest that you give this recipe a shot. They're tasty little bite-sized (decadent) treats.